The Siren and The Specter is easily one of the top 5 haunted house/ghost stories I’ve read, and that’s no small feat—I’ve read damn near all of them and have been fixated by them since I was a child. The Siren and The Specter has everything you could want in a gripping, hard-to-put-down, tight, frightening novel. David Caine, a well-known author and college professor who specializes in debunking the supernatural, is invited to spend a month in a haunted house by a friend who’s hoping to turn the house into a bed & breakfast. From the moment of David’s arrival, tension begins—but vaguely… at first. So vaguely, in fact, and surreptitiously, that the reader is drawn completely into the setting’s atmosphere, the interplay of characters, and the overall mood of the book without even being aware they are actually reading. That, to my way of thinking, is the mark of superior achievement in horror. When an author can magically remove all outward distractions, focus the reader on his or her story, and transport the reader into a realm constructed wholly of supernatural imagination, you are in the presence of someone who is mastering the craft. Characterizations are textbook perfect; from the most minor of participants to the major players, your mind’s eye fleshes them out almost instantly. I was most impressed by Janz’s ability to punch out a character in two or three short sentences and have that character materialize immediately in my head—I knew what they looked like, knew what their motives were, and knew their place in the scheme of things. Knew them… or, at least, knew somebody like them. His characters are real people. Very few of them are painted as pure good or evil; they’re real and entirely believable (even those you wouldn’t want to admit are believable). Perhaps the most refreshing thing about this novel is that every sub-plot, every back-story, every throw-away line, and every thread in the tale is tied together. Nothing is forgotten and not a word is wasted. This is 288 pages of story, story, story—without an ounce of padding. 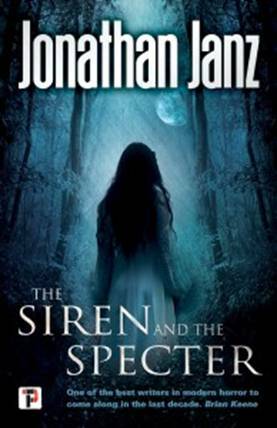 With The Siren and the Specter Jonathan Janz joins Henry James, Shirley Jackson, Stephen King, and Richard Matheson as one of the masters of the haunted house novel—and that is powerful company.